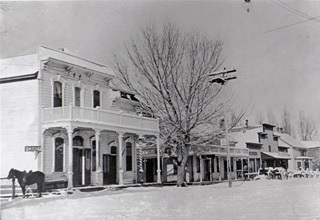 It all started in 1896 when an early Gardnerville entrepeneur named Hans Nelson bought and moved the building from its original location in the Virginia City, Nevada area. Since then, the authentic Victorian building has served as a hotel, saloon and dining hall throughout its more than 100 year history in downtown Gardnerville. With the exception of the hitching post and horse outside, the Lekumberry family has restored the building's facade to look as it did over 100 years ago. 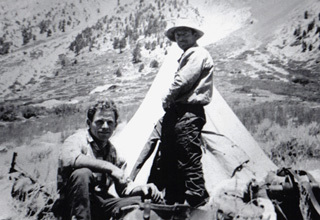 Leaving his homeland on the French side of the Basque Pyrenees mountains in 1947, Jean Lekumberry immigrated to Gardnerville at the age of 22. He arrived with $32 in his pocket. He found work as a sheepherder and his brother Pete soon followed. On April Fool's Day of 1960, the two immigrant brothers along with Jean's wife Shirley, purchased the J.T. 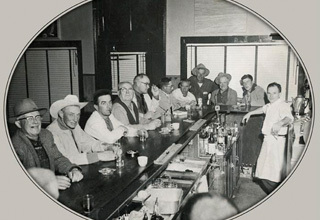 The Lekumberrys were proud to continue the traditions of the established sheepherder hotel, bar and dining room. Founded in 1955 by the Jaunsaras and the Trounday families, the Lekumberrys kept the name that highlighted the previous owners' initials: "J.T." The Lekumberry brothers were delighted to move on from sheepherding and join the other Basque innkeepers in downtown Gardnerville. Jean tended bar, Uncle Pete cooked up the hearty family-style meals, and Shirley ran the dining room and the upstairs hotel. In those days there was one seating for lunch and one seating for dinner. At 12 noon and at 6:00 pm sharp, the dinner bell rang and the sheepherder boarders, ranch hands and town folk took their seats at the long tables and passed the food family-style. The price of the multi-course meal (similar to the one served today) was a whopping $1.25 for lunch and $1.50 for dinner. A Picon Punch set you back 50 cents! 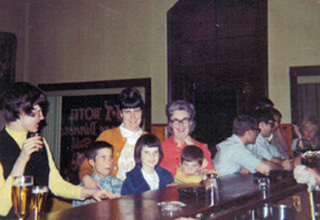 In the midst of the hustle and bustle of the busy bar and dining room, Jean and Shirley raised their three kids Robert, Marie Louise and J.B. Here the next generation learned the value of hard work and every aspect of the family business. You'll find them along with their kids and the friendly JT family of staff keeping the tradition alive everyday. Jean was a natural-born storyteller who loved people. 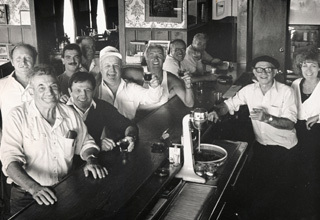 For the 33 years he tended bar until his death in 1993, his way was to make everyone who entered the place feel welcome. He loved to tell stories, talk the politics of the day, and grow vegetables in his big garden for the J.T. kitchen. As the years took their toll and Jean's once heavy hatch of dark hair grew thinner, he began wearing the traditional Basque beret. That, and his perpetual cigar became something of a trademark, which one bar patron caught in a caricature on a napkin. That drawing is now etched on the front window and adorns tee shirts, keeping Jean's genial spirit right here, as it has been for so many years.